UNITED NATIONS, November 14 -- On a day when Security Council Permanent members were asked about sanctions on Syria, virtually all Permanent Representatives had left when Syria took the floor in the Council past 7 pm on Monday. Syrian Ambassador Bashar Ja'afari denouncesd what he called the "state terrorism" of Israel, in the Golan & against the "peace flotilla." He read portions of an article from what he called "the Israeli press," quoting a professor that Israel "can hit European capitals" and wants to deport Palestinians. "It's a long article," he said in conclusion. 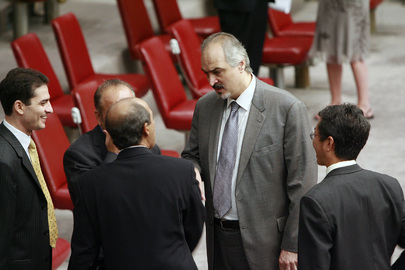 Israel's representative, not Ron Prosor who'd spoken before Cuba and called Syria's "terrorism's Central Bank" but another ambassador, took the floor in reply, saying that "Syria guns down its own people," and "finances terrorist organizations." This being the UN, Syria took the floor again to sur-reply to "the representative of the Israeli occupation," saying "what they did in Dubai, we all know." He cited, and Inner City Press Tweeted tongue in cheek, that this is the view of Desmond Tutu and Jimmy Carter, on "Israeli apartheid." On his way out, when Inner City Press mentioned Jimmy Carter, Ja'afari said there's more, -- "Richard Falk, John Dugard and Jean Ziegler." That, of course, is another story. The Security Council only started its terrorism debate at 4 pm; non-Council members didn't start until 6:30. The European Union didn't have its main Observer still there; all of the P-5 Perm Reps were long gone with Syria and Israel went at it. Ron Prosor complained that Israel's letter about rockets from Gaza had been met with Council silence. In a sense, Israel was left to this time, where Cuba's Permanent Representative spoke of double standards and Luis Posada Carriles. And so it goes at the UN.